The 234 M55 modules were pre-mounted on Unistrut racks so minimal connections were required on site. The unique design was needed to suspend the array over the roof because it was only designed for snow loads. The 300 V, 12 kW array is expected to generate over 15,000 kWh/year. 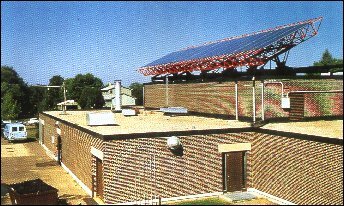 This energy is fed directly into the school providing electricity for the various facility loads. Funding for this project was approved by the Minnesota legislature, 1993 MN laws, Ch. 172, Sec. 14 Subd 4(b) as recommended by the legislative Commission on Minnesota Resources from the Minnesota Future Resource Fund. The installation is being monitored by equipment donated by the local utility, Northern States Power.